These apple pie pancakes are perfect for Fall! This is not your average pancake recipe. 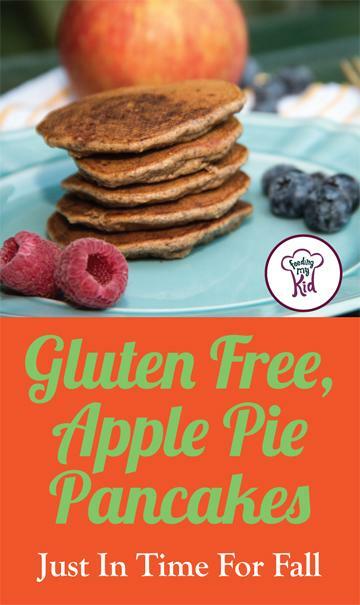 These are gluten-free pancakes, filled with nutritious almond flour, flaxseed, and fresh apples. The flavor profile is similar to eating an apple pie for breakfast. Almond flour is a lot more nutrient dense than all-purpose flour. Using almond flour instead of all-purpose flour makes these pancakes gluten-free and more nutritious. We’ve stopped buying all-purpose flour and use whole wheat or alternatives flours to get more nutrients out of our food. The batter will look a bit clumpy because of your apple, but don’t worry! It will cook into a regular pancake in just a few minutes. I used dates and figs to sweeten these gluten-free pancakes. Dates and figs both have nutrients and fiber that refined sugar does not have. I prefer to use dates and/or figs over honey because when honey is heated up, it loses its nutrients and health benefits, rendering it virtually no different than table sugar. It can help if you soak your figs/dates in water for 5 minutes to puree. My twins are always super hungry in the morning, so I mostly skip that step. Not only will these gluten-free pancakes taste delicious, they’ll also help keep you full longer. Flaxseed will also provide you with fiber, omega-3s and omega-6s. These gluten-free pancakes are the perfect Fall breakfast, but these are so good you’ll want to make them during any season! Try this recipe out for a healthy and delicious breakfast! 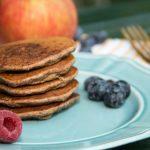 These apple pancakes will bring all the flavors of Fall right to your table. I make homemade pancakes often and I was frustrated with cooking pancakes the entire time while my family was enjoying a leisurely breakfast. I invested in a $30 griddle and it was the best investment– ever. Now, I can cook 15 small pancakes at one time. Delicious, classic apple pie taste with all the flavors of Fall. This is a healthy fiber filled breakfast! Soak your prunes and figs, if needed to make it easier to puree. In a separate bowl, mix together your wet ingredients and beat until fully combined. Add in the mixed wet ingredients into the dry ingredients and mix it up until it's one fully combined mixture and it starts to look like a thick batter. Grate the apples and then use a mixing spoon or a small spatula, fold in the grated apples. Squeeze out some of the juice. Heat your griddle and spray with oil. You can grease your pan with regular oil or butter if you want. Measure out 1/4 cup scoops and cook 1-2 minutes on each side. Flip only once. Cook time might have to be modified depending on your griddle or pan. Continue this process until you finish your batter. Serve immediately. You can also top with extra apple slices or your favorite fruit, if desired. Previous articlePinterest’s Best Breakfast Ideas for Toddlers. Your Kids Will Love These!